…at 8.30am on the Sunday my contractions stopped again! By now my waters had been broken for well over 24 hours so I was taken down to a delivery suite in the consultant-led unit to be induced by drip. Before starting the induction the midwife asked me if I had considered pain relief and recommended a shot of morphine. Being naive I said, “oh no, I’ll use my breathing techniques and see how I get on.” Silly me! 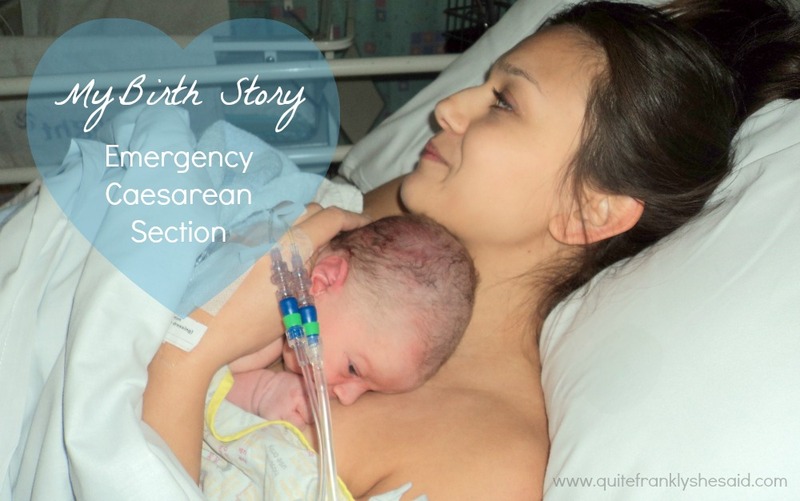 The induction was started and shortly after the contractions started, Noah's heartbeat plummeted. The drip was stopped until a doctor could see me, however he said to carry on. The drip was gradually increased and the contractions got stronger and more painful. They were so much more intense than my own contractions and I struggled to recover after each one, it felt like I had no time to catch my breath. I had a dose of morphine but it did nothing. I was then given entenox which just made me feel dizzy so by the time I was 4cms dilated I was begging, pleading, crying for an epidural. The whole time the baby's heartbeat had continued to dip and the possibility of an emergency c-section was mentioned. Once the epidural took effect the drip was cranked up and within an hour I was 9cms dilated. Noah's heartbeat was still dipping and then the monitor just stopped detecting anything at all. The doctor said that the monitors are only 50% accurate so a blood sample was taken from the baby to confirm whether or not he was in distress. The test showed that he was and by then I was 10cms dilated so theoretically ready to push. At this point I think the shot of morphine had decided to kick in as things started to feel dream-like for me. The baby needed to be born NOW. The doctor said he would use a kiwi-cup – a small sucky thing that attaches to baby’s head – to try to help deliver the baby. With each contraction I was to push as hard as I could and he would pull. It’s really hard to push when you’ve had an epidural as you don’t know you’re having a contraction, the midwife had to tell me when to push. Things seemed really panicky in the delivery suite – everyone was shouting at me to push, there seemed to suddenly be lots of people in the room and people were talking about getting ready for theatre. After three contractions the baby still wasn’t born so suddenly I was being wheeled out of the delivery suite – a c-section it would be. I thought the c-section would be like you seen on One Born Every Minute; they get the babies out in minutes. Not in my case! As soon as they started the incision I had an arterial bleed so they had that to fix before they could even start on the baby. Then things got really scary. I could feel weight and pressure all over my abdomen and the surgeons saying they couldn't get my baby out. Apparently the kiwi-cup had pulled the baby so far down into my pelvis that they now couldn't get him out via the incision. One surgeon was trying to push him back up – yep, up my girly bits - while the other was trying to pull him out. They swapped positions and still couldn't get him. Ian was sitting by my head crying his eyes out and all I could hear were these alarms going off. The room was so full, there were 10 medical staff in there with us at that point. Ian said that a midwife was shouting for Mr M to be paged. Mr M came in and Ian said he was completely calm. He made an extra incision – I later read in my notes that it was a “J” incision in the uterus – and got the baby out in minutes. The baby was in cephalic lie which is normal and so should have been delivered head first. But due to him basically being stuck he was delivered by his hips, as if he was a breech baby. More trauma for him! I'm told that my baby took a while to stimulate, and his notes showed his APGAR score was 2-9 – he scored 2 at 1 minute old which is not good at all, but scored 9 by 5 minutes which is great. I didn't know he was taking a while to recover as I was so out of it after the morphine and two epidurals, and then I went into shock. I didn’t know I was in shock, I thought I was shaking because I was cold. The anaesthetist who sat with me through the whole thing was telling me to calm down as my heart was racing at 145bpm. I've actually just remembered that they brought him over and laid him by my face while they were stitching me back up. My god, he was the most beautiful thing I’d ever seen. We weren't out of the woods yet, but after 46 hours, Noah was finally born weighing 7lb 8.5oz. I was in tears reading that. I think it's a blessing that the drugs can make us a bit out of it. So glad everything was ok in the end. This was so sad to read. You are amazing.thank you for sharing this info and your experience. Glad everything turned out for the best.